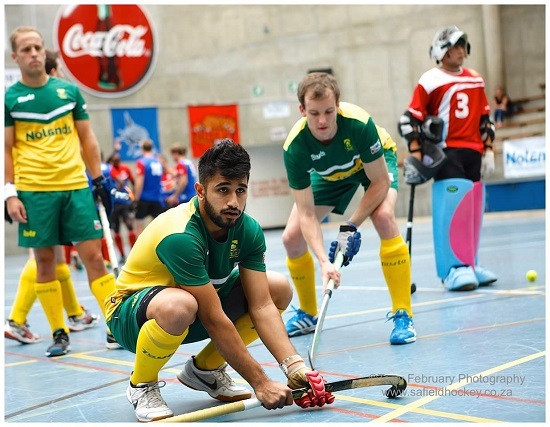 The South African Indoor Hockey sides head off to the FIH Indoor Hockey World Cup in Germany this week in an attempt to take on the best of the best in the shortened indoor version of the game. Today we look at the Men’s side and the challenge they are about to face. 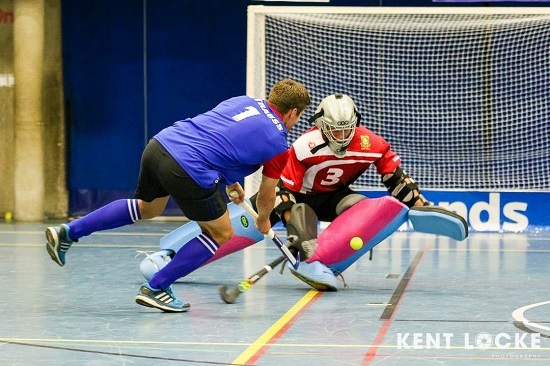 The Nolons sponsored South Africa Indoor squad was announced early in January with a largely Kwazulu-Natal feel to the team featuring 8 from KZN (5 from Coastal Raiders and three from Inland). The squad announced to represent South Africa is – Richard Curtis, Mohamed Mea, Matt Fairweather, Geoff Abbott, Jarryd Jones (all KZN Coastal Raiders); Chris McCathie, Ayden Shrives, Justin Domleo (all KZN Inland); Dale Isaac (capt), Craig Haley (both WP); PG Geldenhuys, Keegan Kieck (both Southern Gauteng). Coach: Ryan Hack. Assistant coach: Pierre le Roux. Manager: Reggie Smith. Physio: Nicholas Pereira. 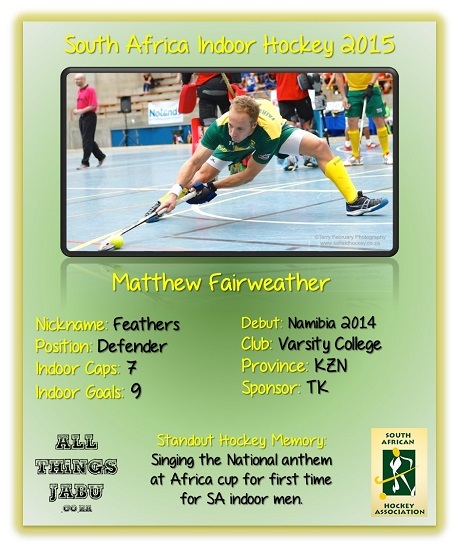 On our Facebook page we will feature one players profile card each day (until we run out) and the first one is already up featuring Matthew Fairweather. Check it out here. The FIH Indoor Hockey World Cup took place for the first time in 2003, held in the same place as 2015, Liepzig in Germany. South Africa, featuring the likes of Raul Texeira and Steve Evans as captain, finished 10th (12 teams competing) after going down to Russia in the placement game. The tournament was won by hosts Germany thumping Poland in the final. 2007 saw the Indoor World Cup move to Austria in the awesome city of Vienna. This time South Africa struggled and eventually scraped into 11th (12 teams competing) with a tight victory over Trinidad and Tobago. The team featured two players that will feature again in 2015, PG Geldenhuys and skipper Dale Isaac. It was Sean Jackson who led the side that year. Germany once again faced Poland in the final and once again defeated them, but it was closer than in 2003. In 2011 South Africa did not attend the World Cup due to funding issues, Namibia was South Africa’s representatives and took a hiding finishing in last place. Germany and Poland met in the final again, but the result was only decided after extra time with the Germans completing the hat-trick. As you may well know, the FIH Indoor Hockey World Cup will get no television screening in South Africa, although with a decent line you may be able to find a quality stream to watch the games. If not the only way to follow what is happening is via social media. The important accounts to follow are the SA Indoor account on Twitter and Instagram. Robert Goslett (Who will be shooting video and may share a few highlights where possible) on Twitter. Of course keep checking in here and we will also update you on all the happenings at the Indoor Hockey World Cup!